Almost one-third of all residential properties in England, Scotland and Wales are at risk of being affected by historic mining activity, according to a new report from Landmark Information. It estimates that 33% of houses are built within 250m of land that might have been used for coalmining and activities such as quarrying of sand, clay and gravel pits in the past. The report was compiled using a range of different data points such as historical mining records from the Open Government Licence v3.0 and information on land potentially contaminated by former industrial use from the Crown. 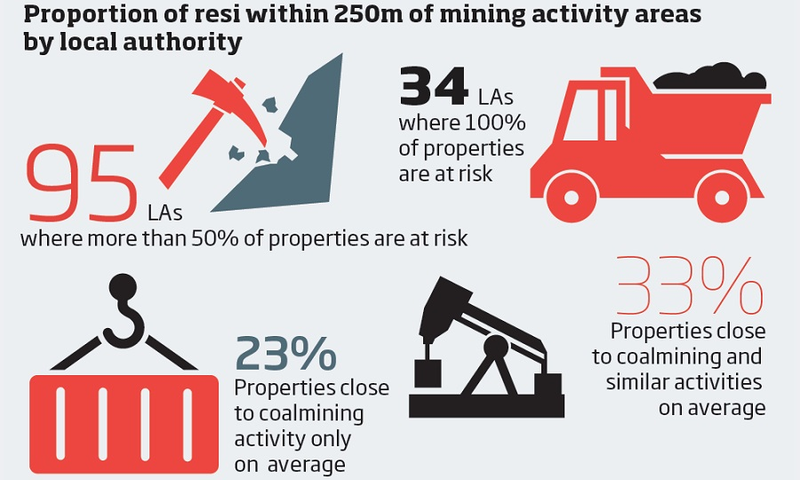 In 95 local authority (LA) areas, the proportion of housing stock at risk is 50% or higher and in 34 areas 100% of housing stock is at risk from former coalmining activity, it warns. The main danger homeowners face from being within close proximity of former mining land is structural damage to housing stock caused by subsidence or heave, says Loaring. The worst-affected parts of the UK are the north of England, Scotland and Wales. The risk decreases significantly in London, with on average 6.5% of housing stock per borough potentially affected. Although Loaring concedes that you can’t change the risk associated with a particular area, he says that “dependent on the type of ground stability issue, there are some management strategies you can employ, for example drain maintenance and/or tree management for shrinking or swelling clay”.